I have posted a tutorial about bunting before back in January of 2008. It has been a while since I have made bunting but Bunny #1 has a school fair coming up and I offered to make bunting for the event. 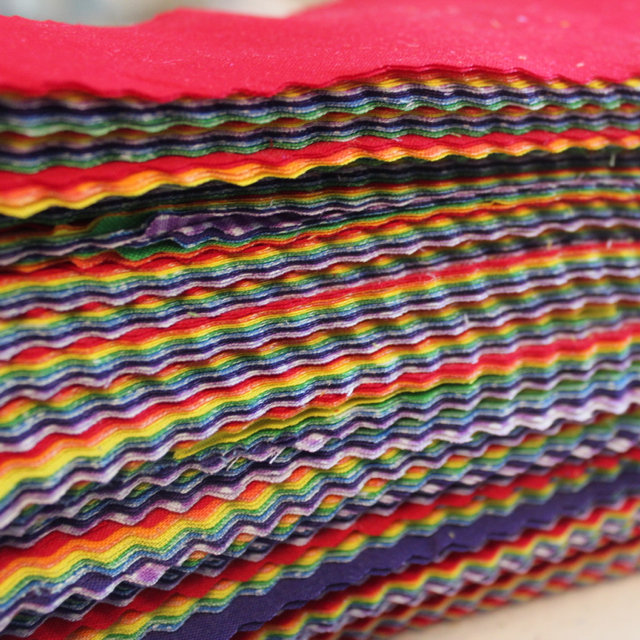 They requested rainbow bunting - I made 5 reams of approx 30 yards (90 feet) each (total 150 yards/450 feet). Bunting is so easy to make - and such an effective decoration - I wanted to update my tutorial with what I learnt this time. 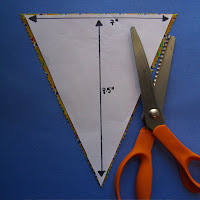 Cut flags using your ruler and rotary pinking blade. Fabric typically comes in widths of 44-45". 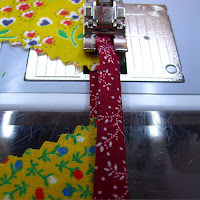 Fold your fabric in half and lay it on your cutting mat. 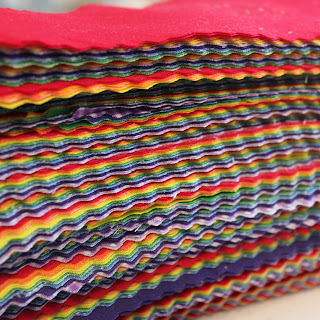 With a standard (straight) rotary blade cut the fabric into strips 8.5" wide. Then using your pinking rotary blade cut the 8.5" strips into triangles as per the diagram below. Each 8.5" strip of fabric should yield you 11 flags in total. The end 6th flag cut on the fabric fold will have to be unfolded and trimmed to the correct size. If you layer your folded fabric (I cut 3-4 fabrics at a time) you can make hundreds of flags in next to no time. Note: I did not remove the selvages from the fabric first - any selvage visible on the tip of the 1st & 11th flag was covered up by the bias tape. 3) Add the flags one by one leaving the same spacing between each flag. 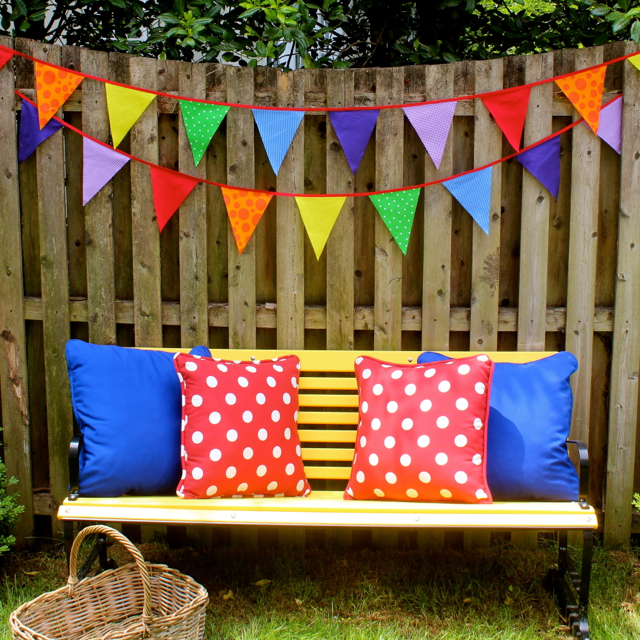 For indoor bunting you can leave a smaller space (approx 1"+) between flags. 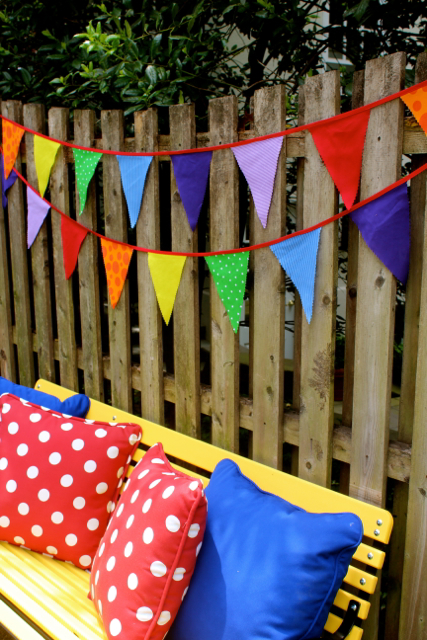 For outdoor bunting you can leave a larger space (approx 3-4") between flags. Note: I used a plain straight stitch - but you could use a decorative stitch if you wanted to. 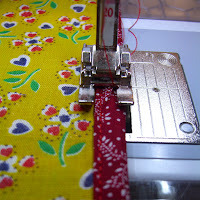 3) Ensure you leave at least 14"+ of the bias tape without any flags at the end of the bias tape too! 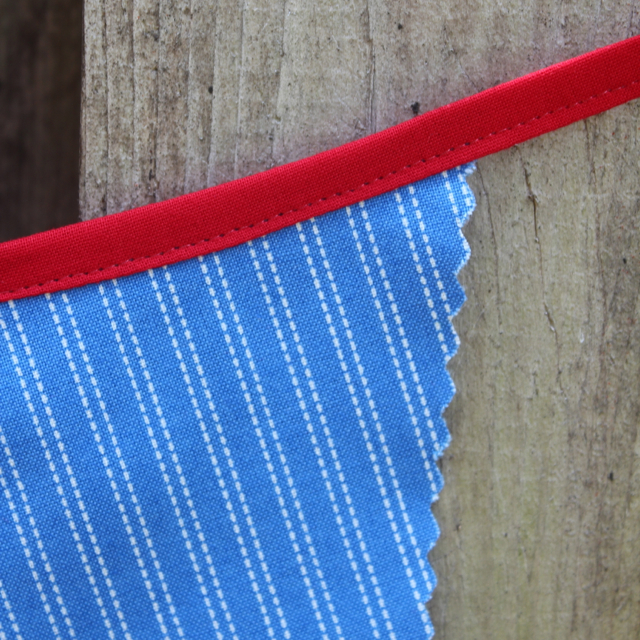 4) Give the bunting a firm press with a steam iron. If you have a large amount of bunting you might want to wrap the bunting around a wide piece of cardboard to keep it flat. 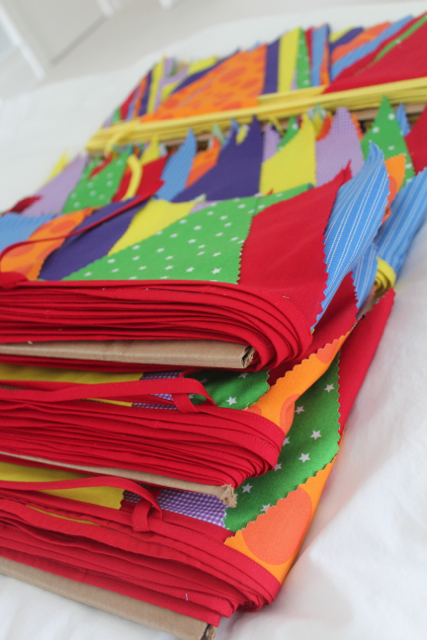 Info about this project: I used 2 yards each of 7 different fabrics to make all the flags. The red, purple and yellow fabrics were all plain cotton broadcloths, the green fabric was Goodnight Spot Stars Green, the violet fabric was Michael Miller Mini Mikes Tiny Gingham Purple, the orange fabric was Michael Miller Apothescary Spooky Spots Pumpkin and the blue fabric Nursery Rhymes Stripe Royal Blue. I tend to buy most of my fabrics from Fabric.com. All the flags cut from this material required approx 5 more yards of fabric made into bias tape. This yielded approx 150 yards+ (450 feet+) of bunting. VERY cute Rachel! I love all the cute, bright colors you've used! This is great! I've been wanting to make a happy birthday bunting! Thanks!